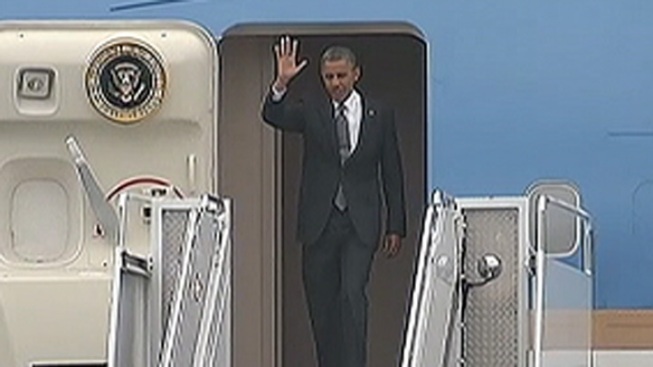 President Barack Obama lands in Philadelphia for the second half of a fundraising blitz. President Barack Obama bolted through Baltimore County Tuesday on the first leg of a 12-hour fundraising blitz. When the day is done, he will have attended six fundraisers, and he didn’t even get started until lunch! Mr. Obama’s first event was a lunch at a private home in the Baltimore suburb of Owings Mills. An unnamed campaign official told NBC News there would be approximately 100 people at the lunch. Tickets started at $10,000 per person. Afterward, the president took part in a campaign roundtable with approximately 15 supporters at the Hyatt Regency in Baltimore. Ticket price: $40,000 per person. The Maryland portion of the tour ended Tuesday afternoon after Gov. Martin O’Malley introduced the president at a reception at the Hyatt Regency. General admission tickets for the reception started at $250. From Baltimore the president traveled to Philadelphia for three fundraising events at the Franklin Institute. The schedule called for the president to attend a campaign roundtable with 25 supporters (ticket price: $40,000) and a reception with approximately 500 people. General admission tickets for the reception start at $250. Later the president is expected to speak at a dinner attended by 75 people. Tickets for the dinner start at $10,000 per person. Proceeds from all six of Tuesday's events will go to the Obama Victory Fund, a joint fundraising committee of Obama for America, the Democratic National Committee and several state Democratic parties, the campaign official said.